As part of WPCentral’s ongoing Xbox 360 coverage, we’ll sometimes discuss console titles of interest to our readers. Kinect Star Wars, which rolls out to retail today, certainly fits that bill. It comes from developer Terminal Reality with LucasArts and Microsoft Studios sharing publishing duties. As the title suggests, Kinect Star Wars is an Xbox 360-exclusive title that requires the Kinect motion-sensing peripheral to play. Players are tasked with helping C3PO and R2-D2 sort through the Jedi archives. The two lovable droids run around and make all kinds of silly quips as you navigate the game’s excellent menus, which also happen to have the best voice controls of any Kinect title so far. Each of the five archives is a distinct game mode, allowing the game to deliver a variety of classic Star Wars moments and gameplay styles. 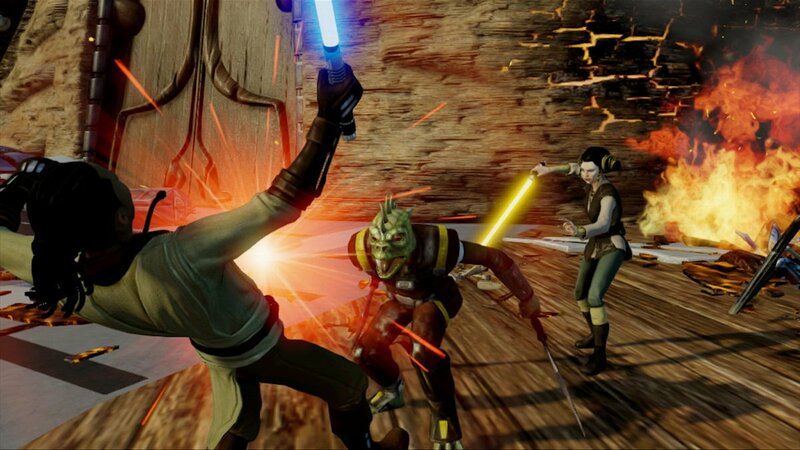 Jedi Destiny: The actual campaign mode casts players as Jedi apprentices who are caught up in a battle good and evil. You’ll fight with a lightsaber, force push and throw opponents, ride vehicles, and more. The experience is largely on rails outside of the combat, but the story and situations certainly do a good job of creating an authentic Star Wars adventure. Staple Clone Wars characters Yoda, Mace Windu, and Obi Wan all show up too, though their voice actors leave something to be desired. Rancor Rampage: It’s like arcade classic Rampage, but with Rancors! That’s right, players get to control a rancor as it runs around smashing buildings, munching on people, and basically being a nuisance. It’s great, silly fun. Podracing: While The Phantom Menace’s podracing sequence was entirely unnecessary, it certainly makes for a good gaming experience. Hold out your arms to steer (not unlike Kinect Joyride) at breakneck speeds. Duels of Fate: Participate in one-on-one lightsaber fights, culminating in a battle against Darth Vader. 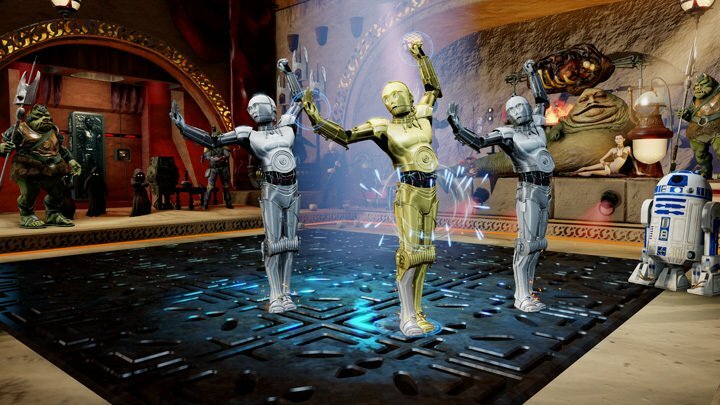 Galactic Dance Off: The most controversial element of Kinect Star Wars is actually one of my favorites. Yes, somebody stuck a dancing game into Star Wars. Choose from a variety of Star Wars-themed covers of real songs and dance along with characters like Boba Fett and Princess Leia amid classic Star Wars backdrops. It plays just like the awesome Dance Central 2 (not to be confused with the crappy Dance Central 2 Dance*Cam). Galactic Dance Off is intentionally silly, and that’s why it works. Take it too seriously and you’re missing the point. Kinect Star Wars, like many Kinect titles, is aimed at the younger set, but that doesn’t mean adults won’t enjoy it too. Everything supports 2 player local co-op, so you and a friend or loved one can let loose and enjoy the Star Wars make-believe together. My family and I have been playing this one for a few days, and we all had a great, sometimes exhausting time. If you’ve been going through Star Wars withdrawal since Star Wars Cantina and Battle for Hoth were pulled from the Windows Phone Marketplace, and you’ve got the right equipment for it, don’t hesitate to give this one a try. Kinect Star Wars is now available for the suggested retail price of $49.99. It requires both an Xbox 360 and Kinect to play. 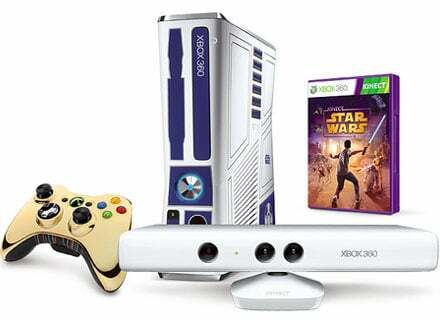 The game also comes packed in with the Xbox 360 Limited Edition Kinect Star Wars Bundle, which includes an R2D2-themed console, a white Kinect, two C3PO-colored controllers, and Kinect Adventures, all for $449.99.